Eldest opens in the aftermath of this battle. Eragon realizes that he needs to learn more and decides to take the advice of The Cripple Who Is Whole and go to the land of the elves in order to study magic and fighting. 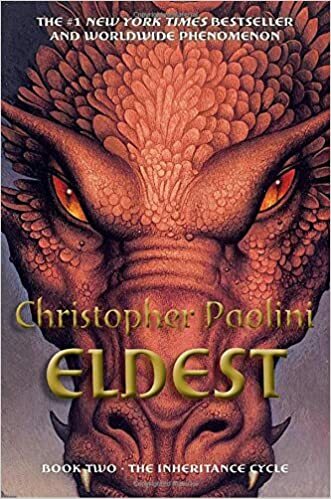 Stability among the Varden is threatened when the leader of the group is killed in a follow-up Urgal-tracking operation; Eragon’s friend Murtagh and a pair of sorcerers named the Twins disappear in the same operation. The Varden choose their fallen leader’s daughter, Nasuada, to lead them; Eragon and Saphira, as important public figures, are asked to endorse this choice, which they do. Before they leave the land of the dwarves, the dwarf king asks to adopt Eragon as an honorary member of his family. Nasuada decides to move the Varden to the free land of Surda to organize another strike against Galbatorix. Eragon, Saphira, Arya, and a dwarf named Orik travel to Ellesméra, the capital city of the elves, which is buried deep in a forest, for further training. There the elves reveal to him The Cripple Who Is Whole, an elderly Dragon Rider; he and his dragon can no longer fight, but they instruct Eragon and Saphira. Eragon becomes a very powerful magician and fighter and, in a ritual celebrating the origin of the Riders, a mysterious dragon magic alters his form so that he takes on the strength and appearance of an elf rather than a person. Meanwhile, he falls in love with Arya, who rebuffs his many advances; the match would be impossible, because she is over a hundred years old and an elf princess. Finally, Eragon and Saphira realize through magical means that Galbatorix’s army is massing for a major attack and go to join the Varden and the people of Surda in the battle. Roran and the villagers arrive via a stolen boat, and Roran makes an important contribution to the battle. Eragon fights mightily, but at a crucial moment another rider appears; one of the two eggs in Galbatorix’s position hatched and Murtagh, who was captured from Farthen Dûr because of the treachery of the Twins, has become a Dragon Rider sworn to do Galbatorix’s will. As he fights his former friend, Murtagh reveals to Eragon that they are brothers; Murtagh’s father, a treacherous Rider who betrayed the order to follow Galbatorix, is also Eragon’s unknown parent. Murtagh’s magic is more powerful than Eragon’s, but he lets Eragon escape. Eragon and Roran are reunited and decide to call each other brother and attempt to rescue Katrina and kill the Ra’zac. 2.39 Chapter 39: Why Do You Fight? Ajihad, the leader of the Varden, Eragon’s friend Murtagh, two magicians called the Twins, and a small group of soldiers, have been tracking retreating Urgals through the tunnels of Farthen Dûr. Eragon and others have assembled to welcome the party on its return, but just as it emerges into sight, Urgals attack the men from behind. By the time Eragon and the others arrive to help, Ajihad’s party has been defeated; the Urgals have disappeared with Murtagh and the Twins, and all the other men are dead or dying. Though a rescue party can’t be mustered immediately, on Eragon’s request, Arya follows the Urgals into the tunnels to try to find the captives. The Council tells Eragon that they have decided to ask Ajihad’s daughter, Nasuada, to be the Varden’s new leader, and, conferring telepathically, Eragon and Saphira deduce that they hope she will be a puppet they can control. The Council leaders ask Eragon and Saphira to support Nasuada’s appointment, and, in a public ceremony, to swear fealty—not to Nasuada herself, but to the Varden and, by implication, the Council. Not wanting to make enemies, Eragon cautiously agrees. Nasuada is called into the chamber and agrees to accept her father’s position. Eragon’s cousin, Roran, returns to the farm where he and Eragon grew up, which was destroyed by Galbatorix’s sinister agents, the Ra’zac, in an attempt to find Saphira’s egg; the attack also killed Roran’s father, Eragon’s Uncle Garrow. Roran has determined to rebuild the farm so that he will have something to offer when he proposes marriage to the butcher’s daughter, Katrina. Pondering why Eragon left the village after causing so much trouble, Roran then returns to the town of Carvahall, where he has been living with the family of Horst, the blacksmith. Roran goes hunting with Horst’s son, Baldor, who advises him to try to win Sloan over rather than proposing to Katrina without his permission. While tracking deer, they see a party of the King’s soldier’s camped in the forest; the Ra’zac are with them, and Roran realizes that this means that the death of his father and the destruction of his home must have been on the King’s orders. Furious, he wants to attack and take revenge, but Baldor convinces him to return home and warn the villagers. On the assumption that, as Eragon’s only remaining relative, Roran is probably the object of the expedition, Horst and his family send Roran away from the village, into the inhospitable local mountain range, the Spine. There he waits and observes as the soldiers set up camp by the village. Eragon and Saphira awaken, not feeling their best, and hurry to attend Ajihad’s funeral. Ajihad is buried in a special part of the burial ground where dwarves believe they must be encased in stone if their spirits are to be allowed rest. Eragon grieves for the Varden’s leader, and also for his friend Murtagh, who vanished in the same attack. Eragon and Saphira prepare to leave Tronjheim, along with Arya, Orik, and a convoy of dwarves to take them as far as Du Weldenvarden, the forest where the elves live. Orik gives Eragon the repaired armor Hrothgar promised him, and along with the armor an offer from Hrothgar, never before made to a human, to adopt him as a member of his own family and clan. Eragon accepts and wears the symbol of Hrothgar’s clan on his helm; now all three races have a claim to his loyalty. The party travels to the end of Farthen Dûr and prepares to continue through a system of tunnels that runs through the rest of the Beor mountain range. that resistance will be useless and want to hand Roran over to the Ra’zac. When the Ra’zac counterattack, Roran acts as a leader among the fighters, and kills two men with his hammer; still, the villagers take heavy casualties. The soldiers are driven off but the Ra’zac promise to return and offer the villagers a choice: turn Roran in and they will be enslaved, resist and they will all be eaten. Roran considers how to convince Katrina to go to safety with the children, and then comes upon men arguing about what to do about the discovery that the passage to the farm is being guarded by the Ra’zac’s men. When the soldiers break through the fortifications, Roran fights alongside Sloan and kills several more men. A child is killed in the battle, and Roran becomes more determined than ever to find a way to send the children and Katrina to safety. The villagers argue about whether they should continue to oppose the Ra’zac and the Empire. Roran convinces them that in any case, the children should be sent to camp out in the Spine, even though the mountains are usually considered too dangerous to enter and Sloan in particular hates the Spine because his wife died falling off a cliff there. Roran then asks Katrina to go into the mountains with the children; she make him promise, in return, that he will never again ask her to leave him because of danger, and he reluctantly agrees. During the night, the Ra’zac and their soldiers enter the house. Roran kills more soldiers, but the Ra’zac still prevail; they wound Roran severely but let him go, and take Katrina back with them. Frantic, Roran and a few others follow them back to the enemy camp, where the soldiers are attempting to mutiny against the inhuman Ra’zac. The Ra’zac kill the leader of the mutiny, but then decide to leave and begin shrieking, summoning horrible flying monsters they will ride away. One takes Katrina from a tent, and the other takes Sloan; Roran realizes that Sloan must be there because he tried to betray the villagers. While Roran and the others watch, the Ra’zac take their prisoners and depart into the night sky. As they continue their river journey into Du Weldenvarden, the elves tell Eragon about the first humans who lived in Alagaësia, in the area around Carvahall. The aggression of their power-hungry king, and the feuding of his descendents, convinced the leader of the Dragon Riders to allow humans to become Riders and oversee their fallible governments. But this system backfired because no one oversaw the Riders themselves, so Galbatorix was able to seize power. Eragon also learns that at some point in history elves became immoral, although he is unable to find out how. This prompts him to ask Arya’s age; both the elf and Orik warn Eragon not to get romantically attached to her, and Eragon feels humiliated that his feelings were so apparent. It turns out that Arya is 100 years old, young for an elf. Later that evening, Arya coldly shoots a dying falcon to save it from further suffering. The party reaches Ellesméra, the capital city of the elves, whose buildings are all also living trees. Arya explains that the elves create their buildings and tools by singing to the forest to encourage it to grow in the shapes they want. Saphira, no longer in hiding, is greeted by the citizens they encounter as they make their way to the great hall where an assembly of elves rules along with Islanzadí, their queen. To Eragon’s surprise, Islanzadí greats Arya as her daughter and apologizes for having wronged her. Queen Islanzadí asks Arya’s forgiveness for having banned her from her presence and Arya eventually grants it. Then Eragon impresses the gathered elves by greeting the queen correctly, as Arya taught him. At the queen’s request, he begins telling his story; because of spells preventing contact with the outside world, the elves knew nothing of the recent events. Eragon also presents Nasuada’s scroll, and Islanzadí agrees to ally with the Varden. She asks Eragon for a ring Brom gave him, and gives it back to him, naming him Elf-Friend, but warns him that the injuries he sustained in fighting Durza may be too severe for him to undergo the elves’ training. Arya then relates the details of her capture by Durza and the torture he subjected her to. Eragon, Saphira, and Orik join the elves in a lavish banquet, vegetarian like all of the elves’ food. They are introduced to Blagden, a raven who once saved Arya’s father’s life and so was given intelligence and long life, as well as a gift of prophecy and a tendency to speak in riddles. They also meet a werecat, who asks them to call her Maud. Then Queen Islanzadí escorts Eragon and Saphira to the treehouse where the first leader of the Dragon Riders lived, and tells him that title is his now. The villagers continue thinking about Roran’s proposal, unwilling to commit to leaving everything they’ve known and worked for, as Horst’s family prepares for the journey. Roran learns from Gertrude the healer that the wound he received on the night of Katrina’s abduction, a Ra’zac bite, is healing badly and that the use of his arm might be permanently damaged. He begins coming to terms with his new identity as the leader of a community fighting desperately for their lives. As Roran walks around the village helping people prepare to leave, various villagers let him know they still blame him and Eragon for the troubles that have befallen the village. Horst’s family decides that the travelers will have to bring their flocks with them for food. The next morning the villagers assemble; only a few have decided to remain behind. At the last moment, the tavern-keeper and his wife decide to join the group, and add several casks of beer to the provisions. The carpenter also presents Roran with a staff he made the night before. Nasuada is taken by Jörmundur to see the child Eragon mistakenly cursed. Though she should only be a baby, the child, Elva, has grown to the size of a three or four year old, and speaks like an adult; Nasuada is uncomfortable in her eerie presence. She tells Nasuada that she can see a few hours into people’s future and is irresistibly compelled to act to protect them from harm. Since the suffering of war brings her acute misery, she asks Nasuada to enlist her unusual powers in any way that would make the war with Galbatorix end faster. Nasuada agrees, and asks Angela to watch Elva, to try to protect her and to keep Nasuada apprised of her doings. A young elf, Vanir, arrives at the treehouse to bring Eragon and Saphira to practice swordplay with other elves. Afraid of a relapse of his back pain, Eragon fights cautiously, and Vanir easily outmaneuvers him, taunting him all the while. Angered, Eragon attacks again and begins overpowering the elf, but his infirmity strikes again, incapacitating him; when he comes to, Vanir is continuing to mock him. Later, while meditating on the ants, Eragon realizes that a reason war with Galbatorix is justified is to rescue the two remaining dragon eggs and save the race of dragons. Oromis congratulates Eragon for his understanding, and then asks him to consider whether anyone thinks of himself as evil; even Urgals, according to Oromis, should be understood not just condemned. Oromis instructs Eragon in energy-efficient ways to kill using magic. While discussing magic as a battle tactic, Eragon realizes that at Farthen Dûr, no one had warned him to protect himself against enemy magicians, a fact that leads to realize that the Twins, leaders of the Varden’s magicians, must have wanted him to be captured by Durza. They also discuss the Ra’zac; Oromis says that they are their own kind of creature not related to any of the other races, and are uniquely designed to hunt humans. Their humanoid forms are actually the pupa stage of Ra’zac development, which lasts for twenty years; adults of the species are the winged creatures Roran saw the Ra’zac riding. Oromis continues explaining about the Ra’zac; the adult form, Lethrblaka, are much more intelligent than the Ra’zac; they came from the same land beyond Alagaësia as the humans did; and the two Ra’zac terrorizing Carvahall and their parents/steeds are the only creatures of their kind left in Alagaësia. After this disturbing discussion, Oromis teaches Eragon how to make a fairth, an image that magically records exactly what the magic user sees. Eragon makes a close-up of a tree branch that Oromis criticizes as another example of Eragon’s overly narrow focus. Then Arya and Orik arrive so that Orik can observe Eragon’s education for his report to Hrothgar. Eragon’s second fairth is a portrait of Arya herself so intensely adoring that Arya shatters it in anger and stalks off. Oromis tells Eragon that he must put aside his personal feelings for the greater cause and Eragon promises to apologize. Roran tells Clovis that they will be transporting livestock, and loads up the barges with the villagers’ supplies. He and a few men will help Clovis and his crew sail down the coast a short way, where they take on the rest of the “cargo.” Entering the city again on the morning of departure, the sentries recognize Roran; he acts decisively to kill them before they can give him away. An alarm is raised, but Roran and his men have already departed on Clovis’s boats, and the captain chooses not to go back. Jeod reveals that he knows the location of the Ra’zac’s lair, but cautions Roran that a human would only get himself killed storming it and that he will need Eragon’s help to rescue Katrina. Then he and the villagers hatch a plan to steal a large, fully-stocked and state-of-the-art ship belonging to the Empire and to set sail on it together for Surda. The assassin commits magical suicide, but not before Trianna learns that he was part of a spy network for Galbatorix called the Black Hand. Nasuada assigns Trianna to use her magicians to try and eradicate these spies. Nasuada brings Elva to a council with King Orrin and the elders of both Surda and the Varden. Orrin has learned Galbatorix’s army is much bigger than had been previously thought and has been massing for an invasion of Surda; a magical illusion had been concealing its activity, one so powerful that it suggests the hand of Galbatorix himself. The leaders debate military strategy, inconclusively; they have no way to contact Eragon, though he will be necessary if their forces must face Galbatorix, but they do send a message asking for reinforcements to Hrothgar and the dwarves. Meditating in the forest, Eragon becomes conscious not only of animal life but also of the minds of plants; he is finally able to hear everything that is going on around him. Oromis tells him that this would ordinarily complete his training as a Rider, but proceeds to teach him the additional skill of drawing energy for spells from the world around him. When Eragon attempts this, his simple incantation drains all the life from the animals and plants he uses; Oromis tells him it is necessary for him to learn the horrible feeling of a linked consciousness dying to understand the danger of his power. Nine days later, Eragon learns that the elves have no religion, but believe in a rational universe. His mentor’s conviction that there is no higher power or order disturbs Eragon, though he is somewhat inclined to agree. Some days later Eragon wakes, upset, to a warning from his dwarf necklace that someone is scrying him again. Then Blagden the raven flies into the treehouse and begins singing riddles to Eragon that suggest he may know something about Eragon’s parents. Frustrated, Eragon decides to scry Arya to make sure she is all right. He and Saphira see her in council with Nasuada and the others and realize the severity and immediacy of the threat to Surda. Eragon also scrys Roran, and sees him on the ship with Jeod and the other villagers; confused, he looks at Carvahall and sees that it has been entirely destroyed. He and Saphira decide that the time has come to leave Ellesméra and fight Galbatorix directly. Eragon asks to take control of the Varden’s magic users to organize them for the battle. He also gets a moment alone with Arya and apologizes for his behavior, but she is no closer to reciprocating his feelings than before. Walking through the camp, Eragon and Saphira then encounter Angela, who berates Eragon for his accidental curse of Elva. When Eragon mentions his surprise that King Orrin has brought scientific instruments onto the battlefield, Angela bustles off to see them and confer with the king. Against Eragon’s advice, Nasuada agrees to meet with a Urgal envoy. Despite his prejudice, Eragon’s new knowledge allows him to explain to the Varden the meaning behind the Urgal’s aggressive-seeming gestures of friendship. The envoy states that the Urgal feel betrayed by their former ally Galbatorix and want revenge on him; for that reason, they want to fight alongside the human rebels. Nasuada agrees to the temporary alliance. Then an envoy from the empire appears, responding to the rebels’ refusal to surrender with a declaration of war. As he gallops back to his camp, Saphira lets out a roar that causes his horse to throw him into the fires of the Burning Plains. Though the villagers had landed safely in a Surda port, Roran has convinced them to row upriver to join the Varden in battle. As Saphira is about to attack the boat, Eragon recognizes Roran. They have a brief telepathic conversation in which Eragon tells the villagers to remain in safety. Roran is both impressed and angered to see his cousin again. Eragon greets Hrothgar and returns to the battle. The tide begins turning in the Varden’s favor, until Eragon gets a terrible surprise: a new and powerful dragon and Rider emerge from Galbatorix’s camp, at the same time that powerful new magicians of theirs also kill the dwarf spell-casters and Hrothgar. Eragon and Saphira fight their new enemies in the air and on the ground, and then, when they are almost drained, Eragon recognizes his opponents fighting style and tears off his helmet to reveal his old friend, Murtagh. Aforementioned boy (see Eragon) learns more and participates in battle to overthrow empire. This page was last modified on 14 January 2018, at 22:06.